Israeli soldiers abducted, on Wednesday at dawn, eleven Palestinians from their homes in several parts of the occupied West Bank, the Palestinian Prisoners’ Society (PPS) has reported. 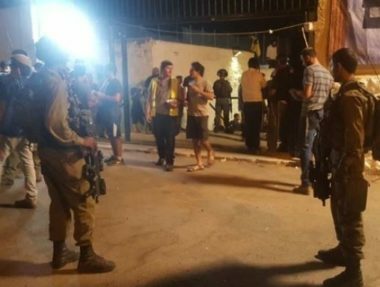 The PPS said the dozens of soldiers invaded the al-‘Isawiya town, in occupied Jerusalem, searched and ransacked many homes and abducted six Palestinians, identified as Yazan Na’aji, Omar Sayyad, Amir Karkash, in addition to a child, Mohammad Atiya, and two young men who remained unidentified at the time of this report. The soldiers also invaded Baqat al-Hatab town, near the northern West Bank city of Qalqilia, and abducted Aseed Barghouthi. In addition, the soldiers abducted Ahmad Wael Oweida, 24, and Ahmad Hasan Abu Bakr, 26, from Tulkarem, in northern West Bank. 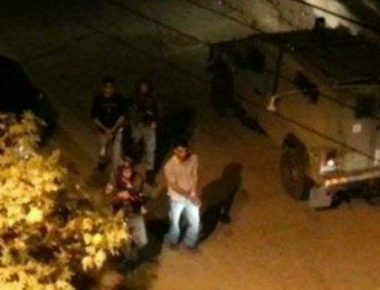 In Ramallah, in central West Bank, the soldiers abducted Samer Silmi Rimawi and Aziz Wael Rimawi, from their homes in Beit Rima town. In related news, Israeli navy ships fired live rounds at Palestinian fishing boats near Beit Lahia, in the northern part of the Gaza Strip.